Add 8 Oreo cookies to a mixing bowl. Using the tip of a meat tenderizer or the tool of your choice, break them up so the resemble dry, crumbly sand. Add in 2 tbsp of melted butter. Mix it together until it resembles a wet sand. Add it to the bottom of a spring form pan and pack it down gently using a spatula. Add the whipping cream to a mixing bowl. Using a whisk or electric mixer, beat it until it doubles in volume and peaks form. This should take about 3 to 5 minutes. Set it aside in the fridge or in a cool place. Make sure the whipping cream is chilled before using it. Put the cream cheese in another mixing bowl. Add in the confectioners sugar and the vanilla extract. Mix until it's well combined and creamy. Add the whipped cream to the cream cheese mixture and beat it together. Break up the other 2 Oreo cookies into tiny bits and fold them into the mixture. Add the cream cheese mixture into the spring form pan so it comes to the top. Smooth it out with a spatula and top it with bits of Oreo cookies. Place it in the fridge and chill until it's set. This should take 5 to 6 hours but overnight is preferred. You can also set it aside in the freezer to have an ice cream consistency. 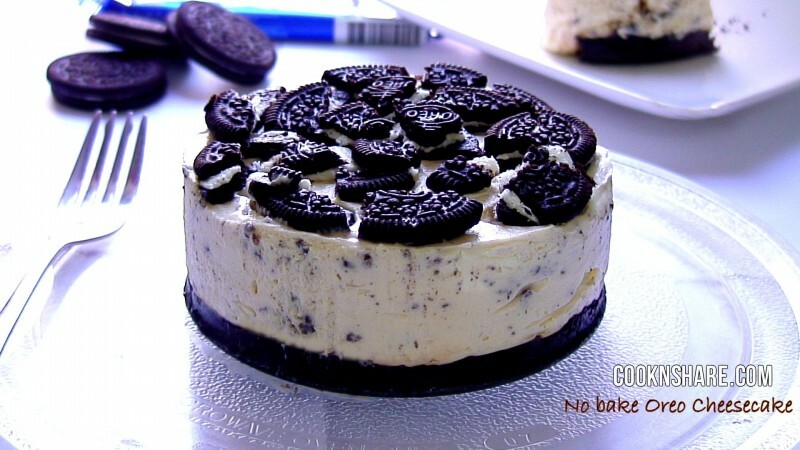 Serve and enjoy your no bake Oreo cheesecake.